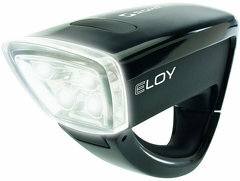 After some research I found the Sigma Eloy bicycle light. 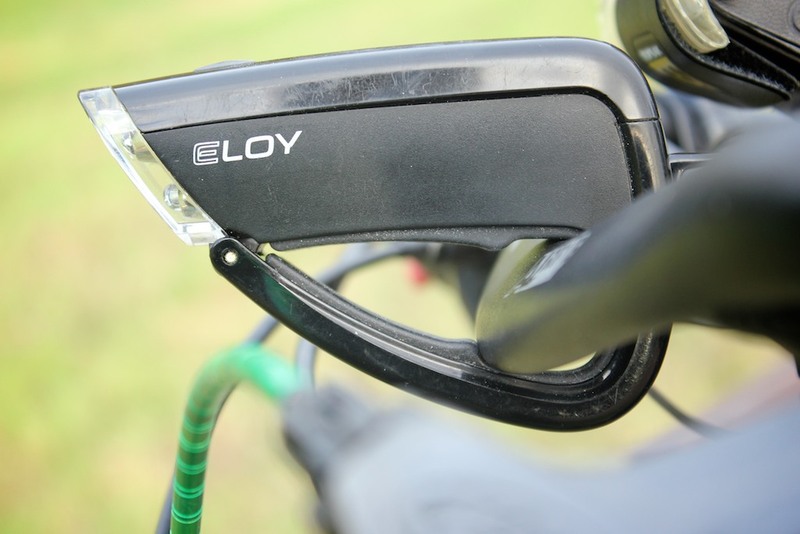 It comes in both white and black and is just under 13 euros online and a little bit more in the bicycle shop. It is also sold as a set with a rear light included. It takes 3 AA batteries which should last 100 hours. That should last me a year which includes commuting through the darkness the whole winter without ever worrying about charging or replacing the batteries. At 140 grams it is pretty light weight and it has a simple integrated clamp that does not require screwing or leaving something on your handlebar when you don't need it. With a little bit of care it even fits on the middle part of my strangely flattened bars, but I did have it turn over when going over some big bumps, I would not recommend it for off road riding, but it's not meant for that anyway. It falls in the category of a safety light, meaning that is mostly meant for other to see you, not for you to see them. Although the four white LEDS are quite bright compared to many cheaper lights the beam is also very wide. In the city does not much to light the surrounding when there is ambient light from street lights and buildings around. In total darkness (like unlit tunnels) it is quite good at lighting up the road a few meters in front. The light is also visible from the sides and has a beam pattern is remarkably good for a small light like this. It is a diffuse round spot that gently fades out away from the center. There are some halos around it but they are so wide that they are not visible on the streets. When mounting it on the bicycle you need to aim it slightly downward to avoid blinding others. The clamping system makes this very easy. It has two settings, continuous and strobe. The strobe setting is annoying, and actually illegal to use in the Netherlands (and some other countries) unfortunately most manufacturers include a blinking mode while there is no proven benefit, this is supposed to be safety equipment, not a toy. There is only one rubber button on top that is easily pressed. On the black version it not very noticeable in the darkness, but if you know it is there it's not hard to find, even with gloves on. When I carried the light in my backpack with various other electronics it turned on once because something pressed against it, that is something to keep in mind when carrying it with you. The button on top of the black version is not very visible in the dark. I found the light also quite usable as a flashlight, and can imagine using it in (bicycle) camping trips as well. 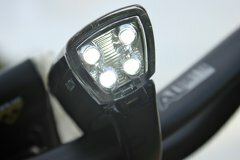 I have purchased two of these lights and and have used one for commuting and night time riding for over a month now. Thus far I am very pleased with it. I pack the light in my bag every day and have noticed some scratching on the plastic housing, but other than that the light is still working fine. The clamping system does not have any signs of wear and the batteries are still going strong. 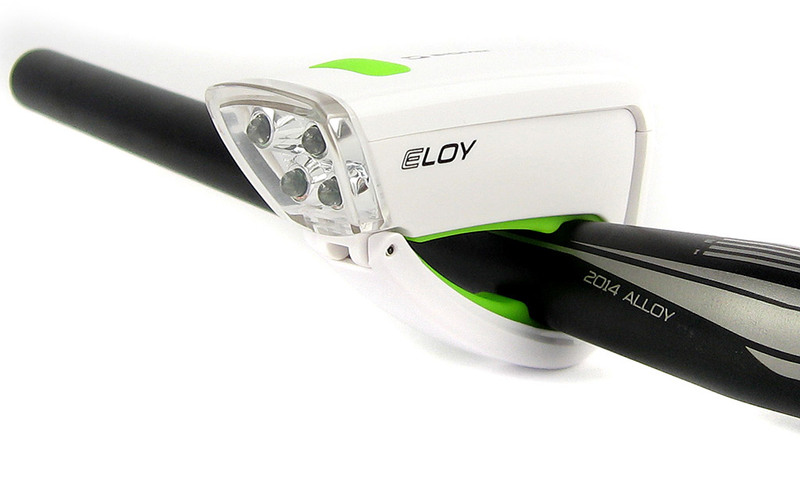 I would recommend this light for anybody in need of a low cost safety light for using in the city. The low cost also makes it ideal as a back up light to keep around the house in case the light of one of your family members or friends fails. After one year the light is still functional, the only visible wear is scratches on the casing, from carrying the light around. This article will be update after more extended use. Sigma Eloy, white version on handlebar. Four white LEDs provide illumination. 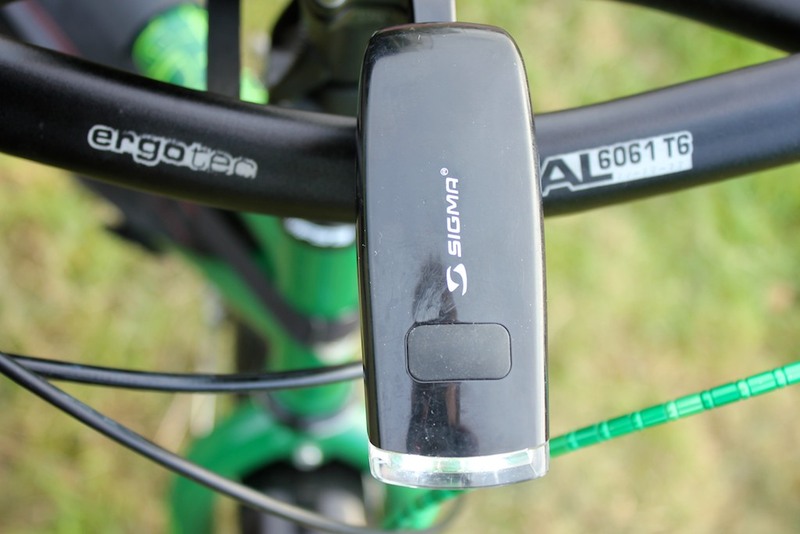 The integrated clamp fits on odd shaped bars.